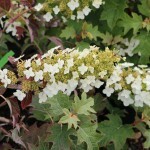 A compact form of Oakleaf Hydrangea. Both leaves and flowers are smaller, for a dense, more refined appearance. 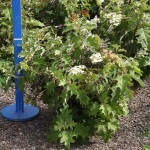 It has white blooms in the early summer that age to pink. The foliage turns to burgundy in the fall. Prefers some shade and a moist, well-drained soil. The size makes it great in a tight space in the garden.